Once you become a patient of our office, you will be given access to your Patient Portal. This access provides a secure communication channel between you and our office. Login to the Patient Portal HERE. "Very thorough and professional. Took a very measured approach with my case." "I truly feel he is as good as they come if you want a true 'by the book' cardiologist." "Best cardiologist in Las Vegas! He truly cares about his patients." "For the past 18 years, he is the only doctor I trust." "This is the doctor we all hope to get when we set an appointment with a new doctor." Ameli | Dadourian Heart Center is the concierge medical office of Dr. Sean S. Ameli and Dr. Berge J. Dadourian, both, double Board Certified in Cardiology and Internal Medicine. The doctors take great pride in offering a customized level of care. The practice offers a cardiology membership called the Patient Alliance, or, combined, expanded primary care cardiology membership called Complete Care. Dr. Ameli and Dr. Dadourian are dedicated to the diagnosis, prevention, and treatment of disease, health maintenance, and patient education. The Ameli | Dadourian Heart Center offers health services including individualized evaluations and on-site laboratory testing, EKG, stress test, heart monitoring, pacemaker testing, pulmonary functions, ultrasound, and nuclear medicine. Patients are encouraged to maintain regular check-ups for continued overall health. Dr. Ameli and Dr. Dadourian are highly respected cardiologists and internal medicine specialists, treating patients in Las Vegas, NV, and the surrounding areas. With a combined 50 years’ worth of experience, Dr. Ameli and Dr. Dadourian have trained at some of the most prestigious programs and universities in the United States. They have held positions at the local, state, and national level in the American Heart Association and American College of Cardiology. Dr. Sean S. Ameli is a graduate of The Feinberg School of Medicine at Northwestern University in Chicago, Illinois. He received his specialty training at Cedars-Sinai Medical Center and was awarded American Heart Association Cardiologist of the Year in 2003, 2005 and 2009. He is currently an adjunct staff of the Cleveland Clinic, and previously a full-time staff of Cedars Saini Medical Center. He is an appointed fellow of the American College of Cardiology, American College of Physicians and the College of Chest Physicians. Dr. Berge J. Dadourian completed his medical training at the David Geffen School of Medicine at UCLA. He is an appointed Fellow of the American College of Cardiology (FACC) and the Society for Cardiovascular Angiography & Interventions. He was awarded American Heart Association Cardiologist of the year in 2005 and 2010. The staff at Ameli | Dadourian Heart Center is highly trained, multi-bilingual, and committed to providing individual quality care to each patient. We are a membership-based only concierge practice and all patients must join the annual program, Patient Alliance, for cardiology care, or Complete Care, for primary care cardiology. Please click here to learn more. - New Patients: CLICK HERE. - To access the Patient Portal: CLICK HERE. Having served the community for over 50 years, we take great pride in providing you with individualized service and evaluations. 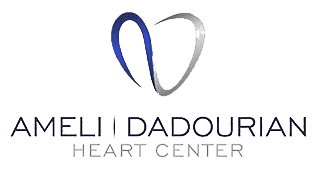 Dr. Ameli and Dr. Dadourian have practiced together for over 20 years and their commitment to you is to provide you with excellent cardiology care and service in a very personalized environment where they know and respect you. Our unique office location in Tivoli Village allows you to visit your doctor and enjoy the European ambiance of Tivoli Village’s many shops and restaurants. *We are now a membership-based only concierge cardiology and primary care practice and all new patients must join the Patient Alliance ﻿or Complete Care program. Please click here to learn more about “Patient Alliance” and "Complete Care". Download, print and complete all pages in the New Patient Packet. Make a list of all medications, supplements and herbs you are taking and the dosage. Gather any cardiac related medical records and testing results. Have your photo ID and insurance cards. Medicare and most insurance plans accepted. Please click on the link, to the right, to view a full listing of companies. Please contact our office if you have any questions regarding the insurance plans we accept. "Dr. Ameli has been an excellent doctor for the many many years I've been using him, as well as compassionate, understanding and very knowledgeable." "Dr Ameli sets the gold standard for medical care. He is patient, kind, insightful, caring, and cares for not only me, but extends his care to my family." "He is amazingly knowledgeable and thorough. So polite and courteous...can disclose a seemingly scary situation in a reassuring way." "Dr. Ameli takes the time to completely answer your questions. He schedules patients far enough apart that he there is no sense of being rushed through." "My experience as a whole was amazing, everyone is friendly, helpful, courteous and I give the highest score and a giant thank you to them!" "He is extremely knowledgeable, thorough and kind. I trust him completely and feel safe with him caring for me and my husband." "I just love Dr. Dadourian because he makes me feel like I am his only patient and he takes the time to explain things when I don't understand." "He takes his time, answers all my questions and never have I felt I'm just a number, I feel very fortunate to be in his care and highly recommend him to anyone." "His responses are direct and helpful. He is highly intelligent and has great depth and breath of medical knowledge. Almost certainly the best doctor I've met." "Dr. Ameli is an amazing physician with a true heart of gold. I was so impressed with his thoroughness and kindness. He truly helped me and was never rushed." "I have been a patient of for many years, have great confidence, and think he and his staff are wonderful. I would never dream of going elsewhere..."
"Dr. Ameli is literally the best cardiologist in Las Vegas"